Oh boy did we used to think we were special when Patty made these! Little do any of us know the recipe is on the back of the powdered sugar bag. Here’s the photo of the recipe from my favorites book. Drop by tablespoon onto cookie sheet. Easiest when dough is at room temp. Bake at 350º until slightly golden at edges. 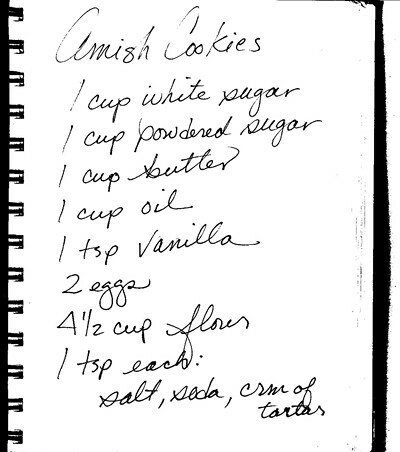 The Amish Cookie recipe was brand spanking new when I first started making them. I got the recipe from Patti O’Brien when we lived in Belgium. 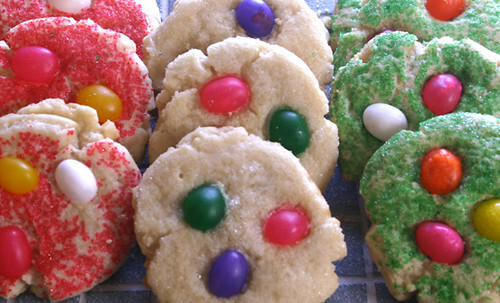 We always made them at Easter with green sugar because they looked like bird’s nests with colored eggs in them. I had never seen a picture of them until Mary featured them at Gourmet-in-a Day. The recipe uses so much powdered sugar, no wonder the sugar company put the recipe on it’s package! Oh wow Mary these sound easy enough for even a beginner like me! Thanks for sharing them. Hope you had a great Easter.